In a special after-school program this week, Red Oak students and their incredible Japanese teacher Meridith Kiyosue (Meri-sensei) presented ROCS families and friends with songs and stories about the Japanese holiday Tsukimi, a celebration of the Harvest Moon. This is a perfect example of what Japanese language and cultural education adds to ROCS’ curriculum, providing us with deep and meaningful, authentic ways to make connections to the natural world throughout the year. 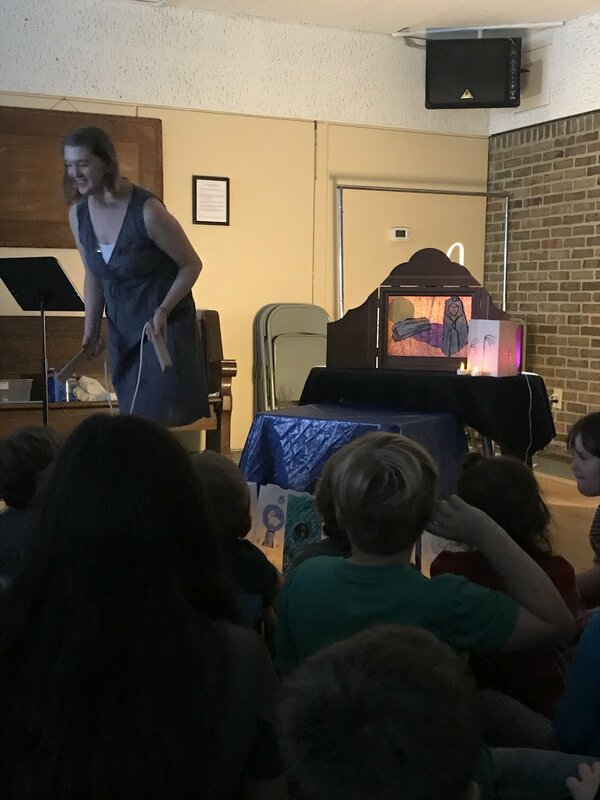 During the program Meri-sensei presented an original kamishibai (paper play) telling the story of “A Rabbit in the Moon.” (Click here for a recording on our Instagram feed!) In this story, the man in the moon comes to earth to see which of her animal inhabitants is most generous. In the forests of Japan, disguised as a hungry old beggar, he encounters a rabbit, a fox, and a monkey each of whom offer to feed him. The fox and monkey quickly find food to share, but rabbit struggles. Not wishing to disappoint the man, he asks his friends to build a fire and announces his plan to jump in to roast himself, becoming a meal for the man. At this point, the man reveals his true identity and carries the rabbit back to the moon to leave with him. This past summer Meridith traveled to Japan and shared glimpses of her time there on Facebook. Through her posts I learned about her passion for kamishibai as an art form as well as a captivating teaching tool. It was amazing to see her stage this performance, her first for an audience with members over he age of 11. Her enthusiasm was palpable, her presentation professional. The original props she created were clever, demonstrating her personal creative practice and how she models that for our students. Kamishibai is an interactive form of storytelling. During the performance the presenter solicits responses from the audience. As Meridith told the story, she asked the kids to name fruits and animals I have heard my daughter reciting at home. The story provided an engaging way to reinforce those lessons with students and evidence of student learning for parents. In addition to her performance, Meridith led our students in a song about tsuki (the moon). This illustrated an oft-cited observation that languages are easier to learn through music. The kids sang the song confidently, and even if they aren’t entirely sure what all the words mean yet, they were wrapping their little mouths around the sounds. Artwork the students made in relation to their studies of Tsukimi were also on view, demonstrating a range of art materials and techniques Meridith shares with the kids as part of her teaching.